So we are into our fourth week in the new pad in Sheffield! The move has tested our relationship, our stamina, our strength and our packing abilities to their limits. I tend to agree when they say the stress of moving is number two on the list of Top Ten Most Stressful Experiences, the first being bereavement! After the fourth day of trundling along the motorway in the cabin of our white van, littered with empty coffee cups, half eaten sandwiches and yorkie wrappers, emotions were running high. Our muscles complained from countless trips up and down three flights of stairs to our flat, balancing box upon box of 13 years of accumulated clutter. As the last bag was dragged through the door, we congratulated ourselves on a job well done – it is quite a feat trying to cram the contents of a three bedroom, three story house into a one and a half bedroom flat. Consolidating one’s personal possessions into ‘can’ or ‘can’t-live-without’ piles, is time consuming and tedious especially when one is predisposed to putting everything in the ‘can’t live without’ pile. ‘But it’s my cheese cloth shirt from 25 years ago’ she says, stating the obvious. ‘You’d forgotten you even owned the rag until we just unearthed it…’ I say, remembering the time I purposely buried it in the cupboard, not wanting to throw it away for fear of reprimand but determined to prevent L from ever wearing it again. Out of sight, out of mind. ‘But it’s one of my faaavourites!’ she whines. ‘So here’s the ultimatum, you can keep that rag if you get rid of the green, oh-so-butchy army pants with the 20,000 pockets!’ Yet another item of clothing I purposely banished to bottom of the cupboard. And so it went on…for two whole hours (that was just the Sports Cupboard!). I hasten to add that both the cheese cloth shirt and the oh-so-butchy army pants made it into the ‘can live without’ pile. PHEW! After systematically tackling each cupboard of the house, bartering, arguing and sulking along the way, until we felt thoroughly cleansed. L is now convinced that we could lead a minimalist life but I’m dubious. When you have a collection of over 100 piggy banks and have trouble parting with your favourite socks which are so holey they’re practically leg warmers, there’s no hope! So Sheffield, the city of steel! The first stainless steel was invented here in 1913by a man called Harry Brearley. We’ve been here less than a month and already I love it! 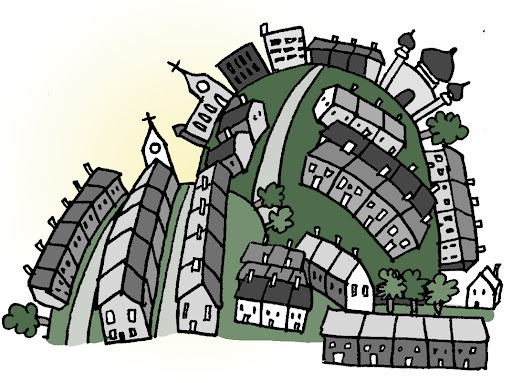 The first thing you notice is that Sheffield is very, very hilly. It has done wonders for my thighs and my cardio vascular fitness. One of Sheffield’s best attributes is its location. The city is within spitting distance of the peak district – Hathersage, Longshaw Estate, Froggat Edge, Bakewell and many more scenic villages are all within 30 minutes of our front door. We are enthusiastically exploring the moorland walks after work and have now created a new cupboard, ‘The walking cupboard’, where our previously underused walking equipment has pride of place. Four weeks in, and we still feel as though we are on an extended holiday. Most mornings before work, I busy myself exploring the local area, testing coffee shops and breathing in the fresh, peak district air. I’m nurturing ruddy cheeks and have been quite surprised that Yorkshire men do indeed live up to the stereotype. I have seen more whippets in the last four weeks than I ever saw during my 12 years in Nottingham! 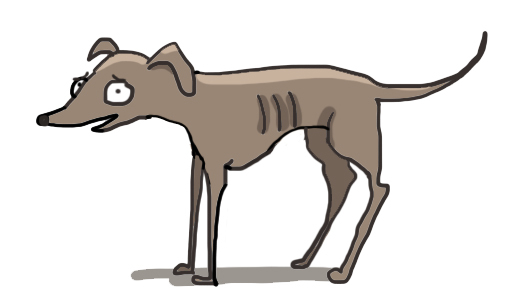 If you aren’t sure what a whippet looks like – it is a small, unnaturally skinny version of a greyhound. They can often be seen wearing a coat to protect their skeletal form from the elements and their sad eyes seem only to communicate one thing, ‘Feed Me!’ (excuse the drawing, I’m testing my new graphics pad). Whenever one moves to a new city, they inevitably have to start from scratch on the friendship front. Ideally, one should throw themselves into a new team sport, group pass time or creative activity that paves the way for extended conversation, drinks and ultimately friendship! Although pigeon racing – a true Yorkshire activity – might be a good place to start, I’m not sure the participants would necessarily be my future best friends (I’m not talking about the pigeons). 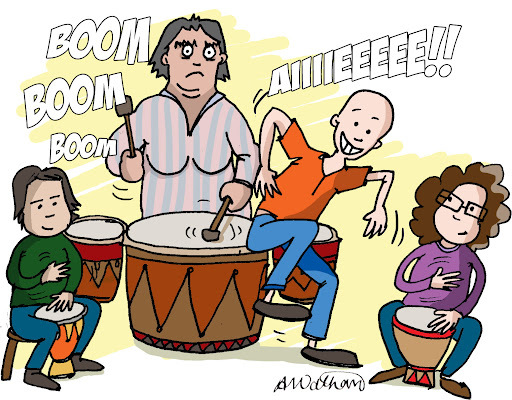 So, with no life drawing classes or softball teams to note, what else is there except….AFRICAN DRUMMING! Oh YEAH! On a whim L and I signed up to a taster session and found ourselves amongst an odd group of people. L’s cheese cloth shirt may not have been a faux pas with this motley crew. There was one particularly scary 6ft lady of considerable girth who, in a trance like state, beat the Dundun drums for the full 1.5 hour session, neither missing a beat nor cracking a smile. Her menancing stare was unfortunate, as was her lack of neckline and 5 o’clock shadow. But, don’t judge a book by its cover I say. Run by a man with extraordinary caffeine-induced energy, who has a tendancy to jump up and down whilst yipping to the beat, it turns out that African Drumming is decidedly good fun. It appeals to ones inner tribal warrior. The leader’s enthusiasm is infectious, even the quietest and shyest people in the group were soon beating their Djembe drum and jigging along chanting the phrase ‘I like cheese’ in time with the beat – don’t ask! As yet we haven’t identified any new friend material but we have the whole 10 week course to get to know people. A slight flaw in our plan might be that drumming is not conducive to conversation. There’s still much to explore and many walks to discover and I’m looking forward to the rest of the year. For now, Sheffield is living up to its reputation as a diverse city with a rich heritage and soul. This entry was posted in General, Life, Uncategorized and tagged city, drumming, Sheffield by bighair63. Bookmark the permalink.